Fruit Shop Christmas Edition Slots | FREE Spins & more! Fruit Shop Christmas Edition Slots is a festively sweet online slot game – Santa’s feeling extra generous with FREE spins, multiplied prizes and more! Good luck! 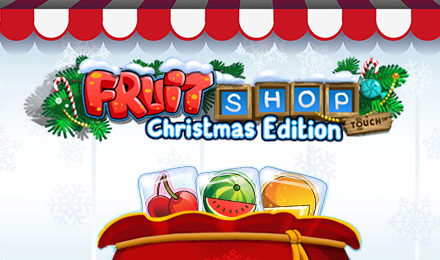 Get in the holiday spirit and enjoy loads of exciting gifts from Santa when you play Fruit Shop Christmas Edition Slots! Ho Ho Ho! Once the reels get rolling, be sure to look out for the game’s Wild – it can replace other symbols to complete a winning line, and when it does, your prize will be DOUBLED! Plus, there are loads of FREE spins and a 96.7% RTP! Grab some eggnog and spin it to win it!